It is tough to get a grasp on the Toba event without something to compare it to. In 1980 Mount St. Helens in Washington state erupted, spewing an 80,000-foot-tall plume of smoke, killing 57 people and destroying 200 homes, 27 bridges, 15 miles of railways and 185 miles of highway. It was the most deadly and economically destructive volcanic eruptions in the history of the United States. For comparison, the largest volcanic eruption in recorded modern historic times was the 1815 Mount Tambora volcanic eruption on the Indonesian island of Sumbawa. It was eighty times as powerful as Mount St. Helen’s and spewed some 100 km3 of rock and made the entire northern hemisphere dark and cold for all of 1816, making it the “Year Without a Summer,” as it became known. But compared to the event that took place in Northern Sumatra, Indonesia some 73,000 years ago, those were next to nothing. Known as the Toba Event, it ejected nearly 2,800 km3, or twenty eight times as much as the largest volcanic eruption in recorded human history, and was more than two thousand times as powerful as Mount St. Helens. It has been called the Yellowstone super volcano’s “bigger” sister, and when this Level 8 mega-colossal volcano–the highest rating on the Volcanic Explosivity Index–erupted it was the largest volcanic eruption in the last 25 million years. It may have nearly annihilated the human species. As the volcano erupted it deposited 6 meters of ash on parts of Malaysia and a 15 centimetre-thick ash layer over the entire Indian subcontinent; acid rain fell for years. The temperature of the planet fell abruptly 3–5°C and according to some (based on ice cores from Greenland) it jump-started a global ice age. It just so happens that this massive environmental catastrophe coincides with evidence for a massive human population decline resulting in a genetic bottleneck. According to the Toba catastrophe theory, the resulting 6- to 10-year volcanic winter destroyed most of the vegetation in the area where humans would have been living and may have reduced the population to as few a 1000 breeding pairs. There is some good evidence for this genetic bottleneck, and many geneticists feel that evidence suggests that all living humans, despite apparent variety, descend from a very small population, perhaps between 1,000 to 10,000 breeding pairs dating to about 70,000 years ago. It is also known that Eastern African chimpanzee, Bornean orangutan, central Indian macaque, and tigers all recovered from population bottelnecks dating to around the same time. All of which would seem to fit neatly with the Toba super volcano event and the Toba catastrophe theory. But as it always is in science nothing is neat or easy, and contradictory evidence is just as strong. Among the contradictory evidence are similar tools found in India below and above the ash layer suggesting a life relatively unchanged, and the fact that non-human hominids such as Homo Erectus Soloensis, Homo Floresiensis, Homo Neanderthalensis all of whom should have been just as adversely affected by the volcano, seem to have survived though the catastrophe without the same evidence of genetic bottlenecking. Regardless, whether it nearly wiped out humanity or not, for all the humans that were alive 75,000 years ago. the Toba eruption must have certainly seemed like the end of the world. 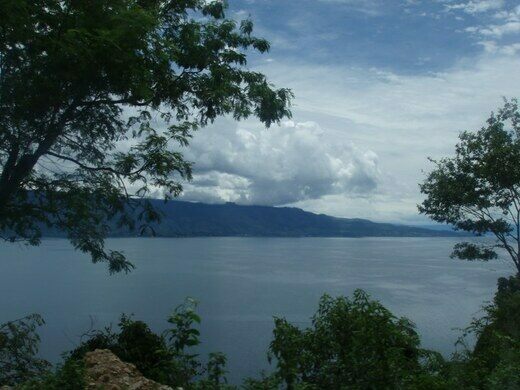 Today the caldera left by the massive volcanic cataclysm is occupied by Lake Toba. 62 miles long, 18 miles wide, and 1,666 ft its deepest point, it is the largest volcanic lake and largest volcanic structure in the world. The island in the middle was formed by the pressure of magma below pushing up on the land. Eventually, the Toba super volcano will erupt once again. The closest major Indonesian city is Medan, and organized bus tours out of Medan to the area are plentiful; you can also hire a car. The place to visit/stay is Prapat, on the eastern shore. 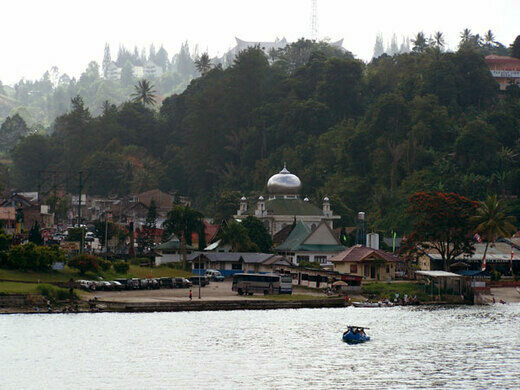 You can take a quick ferry across to Samosir Island, where there are numerous small hostels and restaurants. 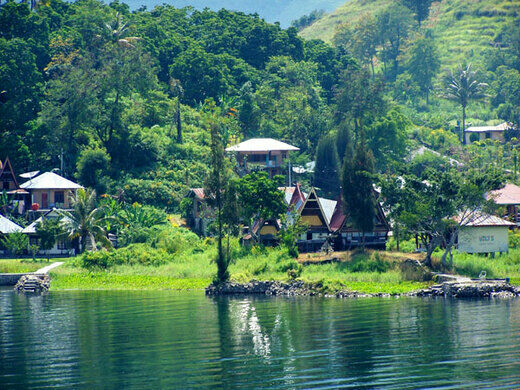 To the north on the island are ancient Toba Batak villages, including at least one with a cannibal history.As already known, Samosir is an island located in the middle of Lake Toba. So if you want to go there, there are 2 options: through the water line (ferry) or the land route. Malaysian fireflies create a dazzling display as thousands light up in unison.